Most people don’t like processes and regulations, but one thing is for sure: no team can create a successful software product without following a solid software development workflow. Having learned the hard way, our RubyGarage team has come up with a clear, transparent, and well-structured Git and release management workflow that helps us build high-quality applications as quickly and efficiently as possible. Our workflow encompasses the best practices of the Extreme Programming practices of the agile software development methodology, so it’s iterative and helps our team deliver products that meet the evolving business goals of our clients. In this guide, we showcase our RubyGarage Git/GitHub and release management workflow so that you have a complete understanding of the steps we take to roll out prime software products. To make this guide easier to understand and more illustrative, let’s imagine we need to implement sign-up with email and password functionality in a web application. We’re going to take a close look at how a RubyGarage developer fulfils this task from beginning to end. Before we start, however, you should clearly understand how we manage tasks at RubyGarage. We use a task management system (Jira) for managing our software product development workflow in compliance with the agile software development methodology. Backlog − for tasks that haven’t been included in the current sprint and will be fulfilled during future sprints. To Do − for all tasks that must be completed during the current sprint. In other words, this is the sprint backlog. The tasks are added to the To Do list by the product owner and estimated in story points by the whole development team during planning meetings. All tasks in the To Do list should be validated by all members of the development team and need to have detailed descriptions (design, scenarios, and acceptance criteria) before developers can start implementing functionality. In Progress − for all tasks that developers are working on at the moment; each developer has to work on a single task from this list. In Review − for tasks that are ready to be reviewed by the members of the development team and the team lead. In Testing − for completed tasks that are ready for testing by a QA specialist. 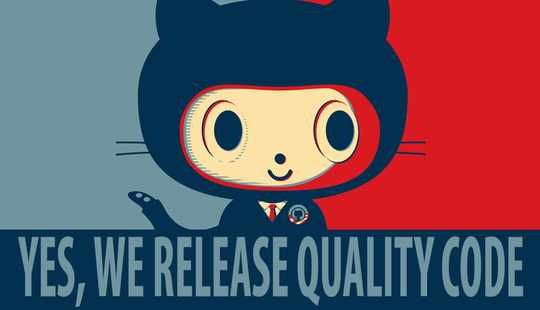 Release − for tasks that have been tested and approved by a QA specialist and are ready for the current release. 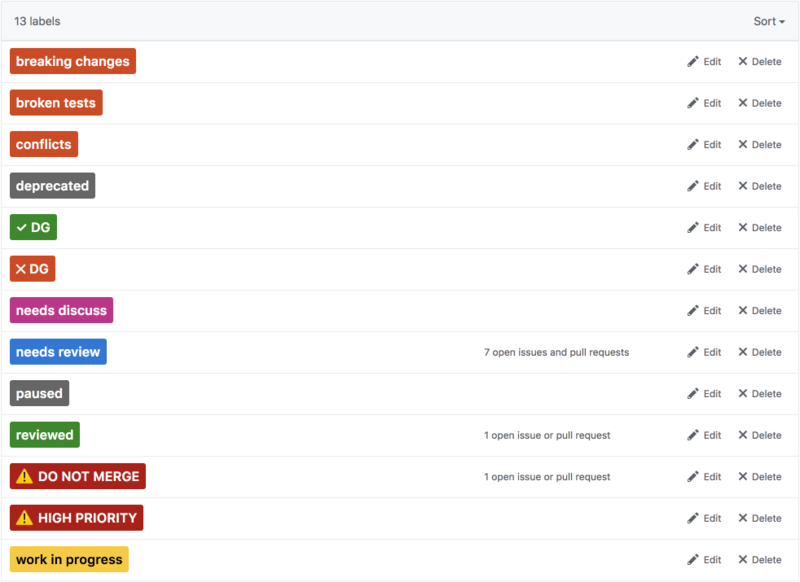 Tasks in the To Do list in Jira are prioritized by the product owner, so a developer should select a task with a higher priority. At RubyGarage, we strictly follow the one developer − one task rule, so team members aren’t allowed to work on several tasks at a time. The developer needs to assign the task to themselves so that team members can see that this task is already taken. Once the developer has assigned the task to themselves, they move it to the In Progress list on the board. This step is crucial so all team members can track which task each developer is working on at the moment. Prior to coding, the developer should carefully think through how they’re going to implement the sign-up with email and password functionality and discuss their potential solution with the team lead or fellow developers. This helps ensure that the developer knows the best way to complete the task and won’t waste time on implementing an incorrect solution. 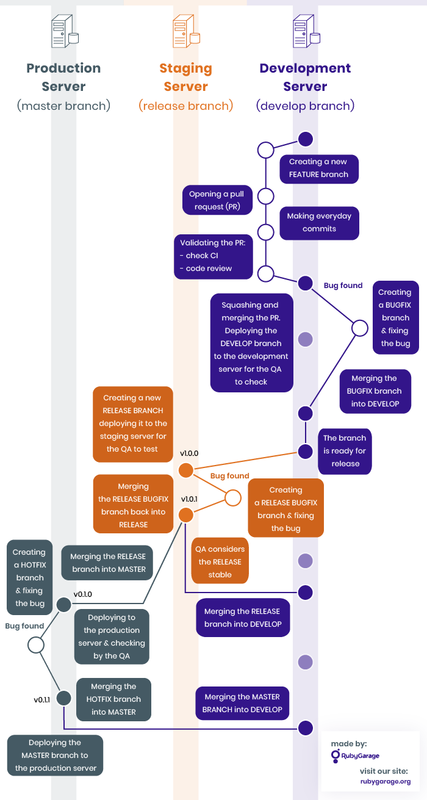 Before we move to concrete steps the developer takes to fulfil the task and deliver functional code, you need to understand how we work with Git and what branches RubyGarage developers use. At RubyGarage, we use Git for version control and Gitflow (check out the RubyGarage Gitflow guide) for a branching model. 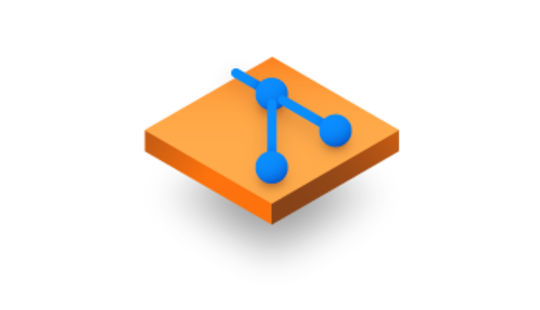 Gitflow provides a set of rules and conventions for working with Git, thus minimizing potential merge conflicts and making Git much easier to use. 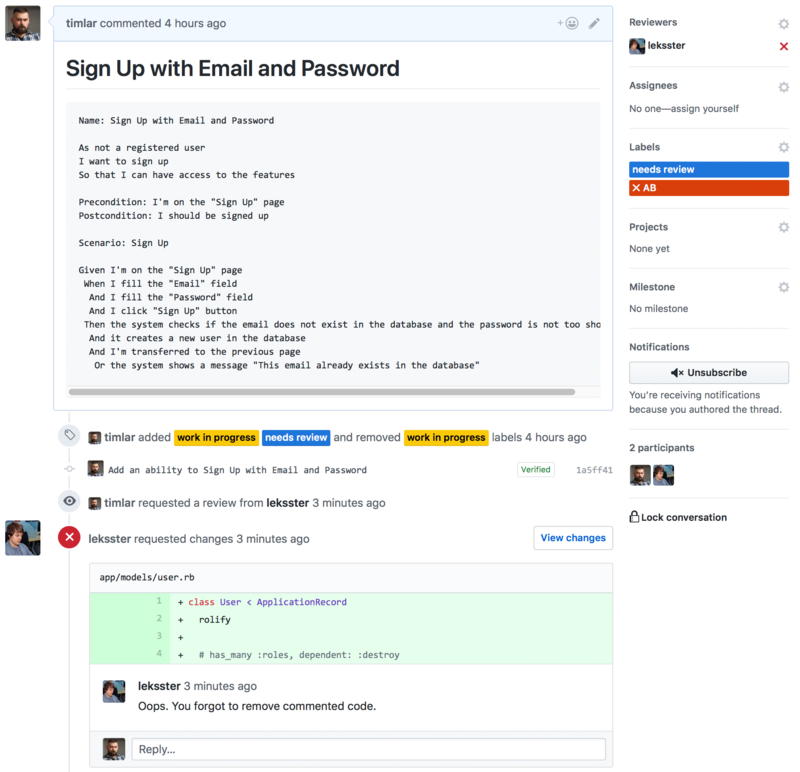 To facilitate collaboration between developers, we use GitHub − the world’s leading development platform. 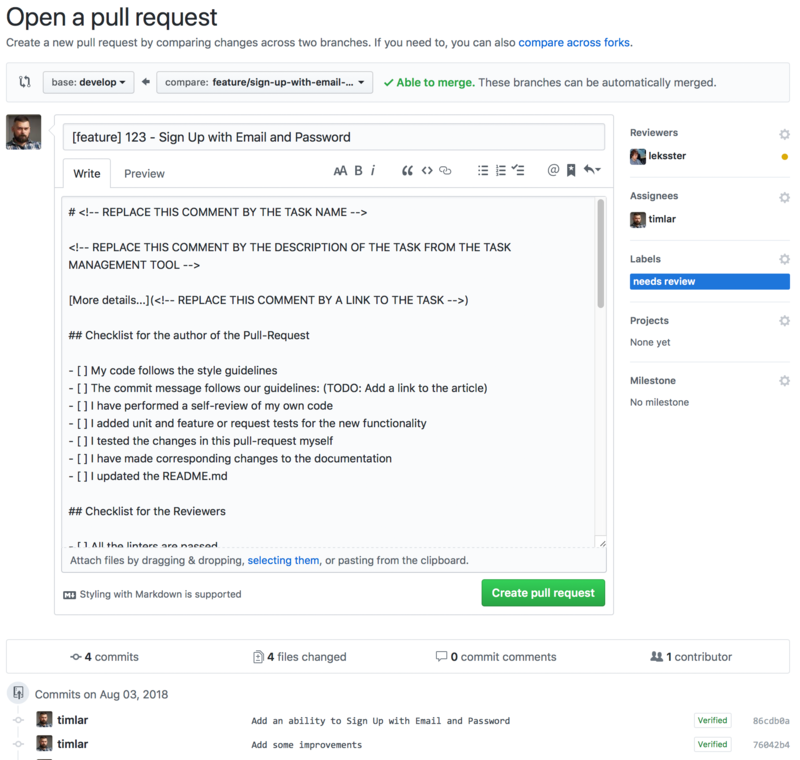 GitHub helps developers manage, discuss, and review code by means of pull requests. 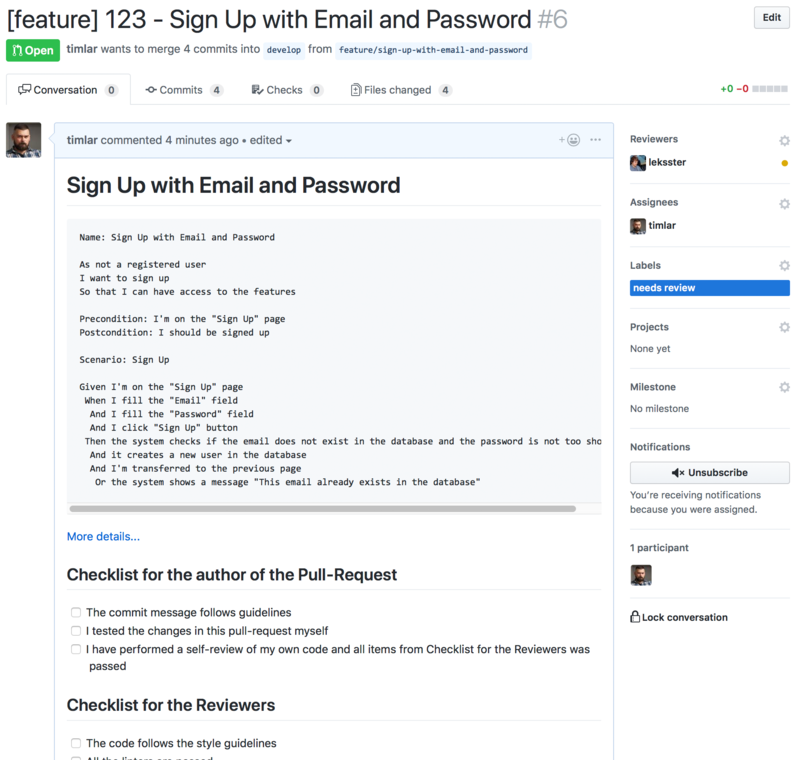 However, BitBucket supports similar functionality, so you can set up the same Git workflow with it too. 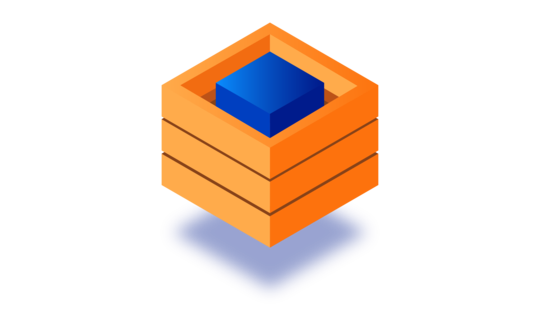 RubyGarage developers use four types of supporting branches to facilitate parallel development between team members, make it easier to track features, prepare releases, and fix bugs in production. The supporting branches have limited lifespans and are removed after being merged into the main branches. These branches are created from develop; each feature branch is used to implement a single task. After completing the task, the feature branch must be merged into develop. To avoid ambiguity, we use a specific naming convention for feature branches − they always begin with feature/ followed by a description based on the functionality implemented by the feature. For example: feature/sign-up-with-email-and-password. Thanks to this naming, team members can easily tell what code each branch contains. This branch is created every iteration (i.e. sprint) from develop, and when the team rolls out a release it’s deployed to the staging server for testing. A stable release is merged first into the master branch and then into develop. The naming convention for this branch starts with release/ followed by its version. For example, release/v1.0.1. 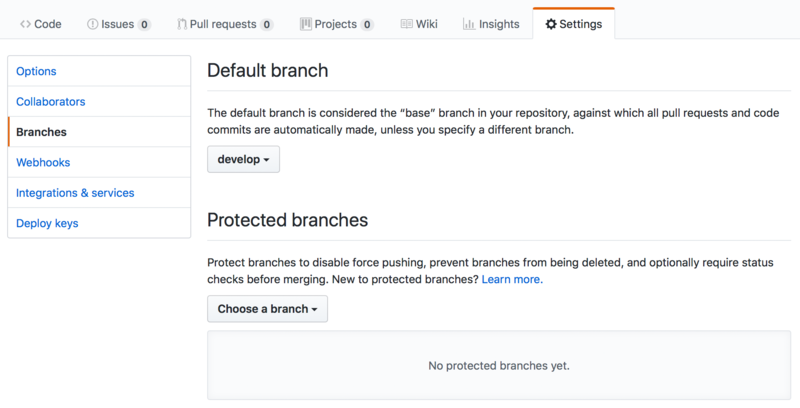 This branch is created for handling emergency situations − it allows developers to quickly fix something in production. This branch uses master as the parent branch and merges into both master and develop. The name of this branch starts with hotfix/ followed by its version. For example, hotfix/v0.1.1. These branches are created in case the release requires bug fixes. The parent branch depends on the circumstances: it can be either release or develop. The name of this branch starts with bugfix/ followed by the description of what exactly is to be fixed: for example, bugfix/fix-small-bug. This command initializes Gitflow, creates a new develop branch, and switches to it. Note: in this article, we show Gitflow commands and the corresponding commands in pure Git. Pushing commits to the remote repository allows other developers on the team to access them and, therefore, suggest changes if the developer has gone the wrong way. In case the developer hasn’t finished the task during one day of work, they still need to push new commits to the remote repository every day. work in progress (color: fbca04) − A developer is working on the PR. needs review (color: 1d76db) − A developer has made the final commit and the PR needs to be checked by reviewers. reviewed (color: 0e8a16) − The PR has already been reviewed. broken tests (color: d93f0b) − The PR has failed to pass automated tests on the continuous integration server. conflicts (color: d93f0b) − There are conflicts in the PR. deprecated (color: 666666) − The PR contains code which is already deprecated or no longer necessary. breaking changes (color: d93f0b) − The PR contains significant changes to the API interface architecture. paused (color: 666666) − The PR is put on hold, for example in case there are more urgent things to do. needs discuss (color: c9208b) − The PR requires discussion with the product owner or the whole team. needs rework (color: 006b75) − The PR requires changes. release (color: c9208b) − The PR belongs to the release branch. :warning: DO NOT MERGE (color: b60205) − The PR is correct but for some reason it mustn’t be merged into the respective branch. :attention: HIGH PRIORITY (color: b60205) − Denotes high-priority pull requests that must be reviewed and merged first. ✓ XY (color: 0e8a16) − Tells that a reviewer has approved the PR. ✕ XY (color: d93f0b) − Indicates that a reviewer hasn’t approved the PR. In these labels, X and Y are the reviewer’s initials. For example, if a developer’s name is John Smith, his additional labels will be ✓ JS and ✕ JS. This is how it looks for our sample task: [feature] 123 - Sign Up with Email and Password. A detailed pull request description provides members of the development team with complete information about each pull request, which is particularly important for reviewers as they need to fully understand what the code does to know if it’s written correctly. Unit and functional tests that the developer writes for every feature they implement; the continuous integration service also shows the test coverage in the current pull request. Linters (such as Rubocop, Bundler-audit, Rubycritic, Brakeman, and Rails Best Practices), which perform static code analysis to detect code quality issues. Before the pull request can be sent for review, the developer has to run through the checklist and make sure that it meets all requirements. If something is wrong, for example if automated tests fail or linters reveal bugs, the developer has to fix all these issues. Sending pull requests that don’t meet the requirements in the checklist is strictly forbidden. 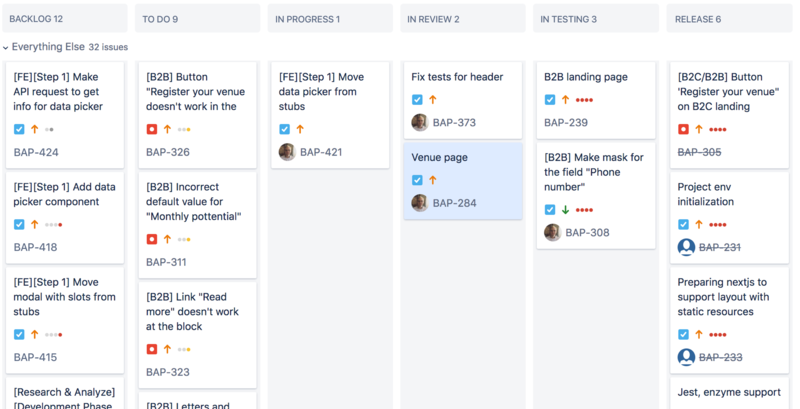 If everything is correct, the developer replaces the work in progress label with needs review on GitHub and, in parallel, moves the task card from the In Progress to the In Review list in Jira. If the developer agrees with the requested changes, they carry out fixes in the pull request. To do that, the developer creates separate commits and pushes them to the remote repository. The use of separate commits allows other developers to check only the latest changes without wasting time checking the code they’ve already reviewed. When the developer has made fixes, they add the needs review label on GitHub again so that other developers on the team know they can take a look at the pull request and check what changes (if any) have been made. If developers review the pull request and approve it, they put their personal ✓ XY labels. The last reviewer should remove the needs review label and apply the reviewed label. 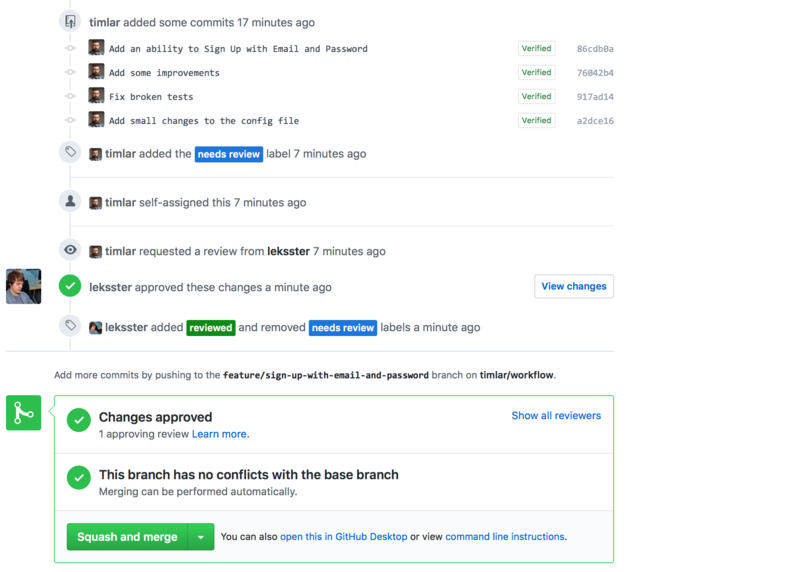 Now that the pull request has been reviewed and approved, the developer needs to merge the feature branch into the develop branch. The rest is simple − the developer clicks the Confirm squash and merge button and GitHub automatically squashes all commits into one and merges this squashed commit into the develop branch. Also, it’s important to deploy the develop branch to the development server. In the end, the developer moves the task to the In Testing list in Jira so that a QA specialist can see that the task has been finished and can start checking it for bugs and errors. If the QA specialist doesn’t find errors or bugs, they move the task forward to the Release list, thus indicating that the feature is ready for inclusion in an upcoming release. If, however, the QA specialist does find bugs, they write a bug report and add a new bug fixing task to the To Do list in Jira. Needless to say, the bug fixing task has to be fulfilled by the developer who implemented the feature. The bug fixing task must be handled just like any other task, so the sequence is the same as we’ve described above. Since the RubyGarage team follows the Scrum framework, each team has to release production-ready code at the end of each sprint. To make sure the release performs correctly and contains no bugs or errors, it has to be deployed to the staging server and checked by the QA specialist, who runs smoke, sanity, and regression tests. After that, an updated release branch must be re-deployed to the staging server and tested by the QA specialist one more time to make sure everything works correctly. When the team has deployed the release to the production server, the QA specialist needs to make sure the code runs correctly and there are no errors. It’s also possible that end users or support managers report errors in the live production version of an application. Needless to say, such errors must be fixed immediately. Finally, the master branch must be re-deployed to the production server. Our product development workflow is simple, clear, and focused on quality. 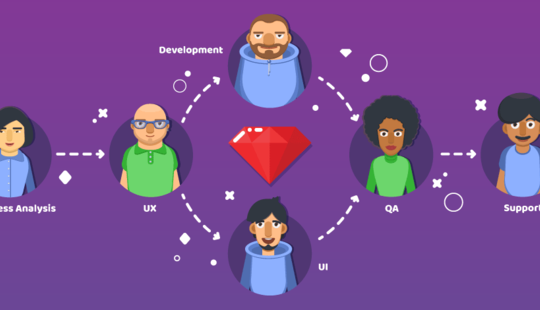 It perfectly fits the Extreme Programming methodology that RubyGarage follows and helps us deliver secure and functional code after each iteration. At the same time, our team keeps up with the latest advances in the world of software development and project management, so we’re always eager to adopt new efficient practices. To stay updated on how RubyGarage developers work and what technologies our team uses, subscribe to our newsletter. Hi , Firstly, I wanna thank you for this great article.I wanna ask a small question about "Step #7 Fixing the master branch". After creating a hotfix branch ( hotfix/0.1.1 ) , a developer should create a branch from hotfix/0.1.1 in order to fix the bugs like ; > git checkout -b hotfix/wrong_validation_user_name hotfix/0.1.1 After fixing the bug(s) , developer will create a PR. Is that right ? Thanks. Hi, Erhan! Thank you for such an interesting question! We will be back soon with an answer for you. From Environment perspective , we can have Feature branch = DEV env, Develop branch = DEV-INT env, Release branch = UAT env, Master barnch = PROD env. Question : - when Release got the bug and developer take the code as bugfix/ and fix the same, where developer should test and provide results before it can be merged to release branch. Thanks, in this case this bugfix should also be merged to development branch so that for future releases , this bug do not reoccur. Can we use this bugfix also for the defects identified in development branch. Hi! In case a release requires bug fixes, the bugfix branch is created from the release branch. A developer fixes the bug and writes automated tests locally. Then, the developer creates a new pull request and merges the bugfix into the release branch that is deployed to the staging server. After that, a QA specialist checks the release once again to verify that the bug has been fixed.